You could substitute just about anything for the frozen mixed vegetables in this wonderful five ingredient recipe for Easy Crockpot Meatball Soup. Try adding sliced carrots, some chopped onions, perhaps a chopped potato or two. You can make your own Easy Meatballs instead of purchasing frozen precooked ones if you'd like. The meatballs should be frozen when they are added to the slow cooker, so make them ahead of time, cool them, and freeze if you want to use a homemade version. Because this recipe is a soup, it is very tolerant. That means you can make lots of changes and the recipe will still work and be delicious. When you hit upon a combination that you like, be sure to write it down so you can reproduce it. And have fun experimenting with slow cooker soups. There are infinite possibilities and combinations! All you need to serve with this soup is a green salad and perhaps some dinner rolls, scones, or breadsticks. Sit back, relax, and enjoy this easy meal. 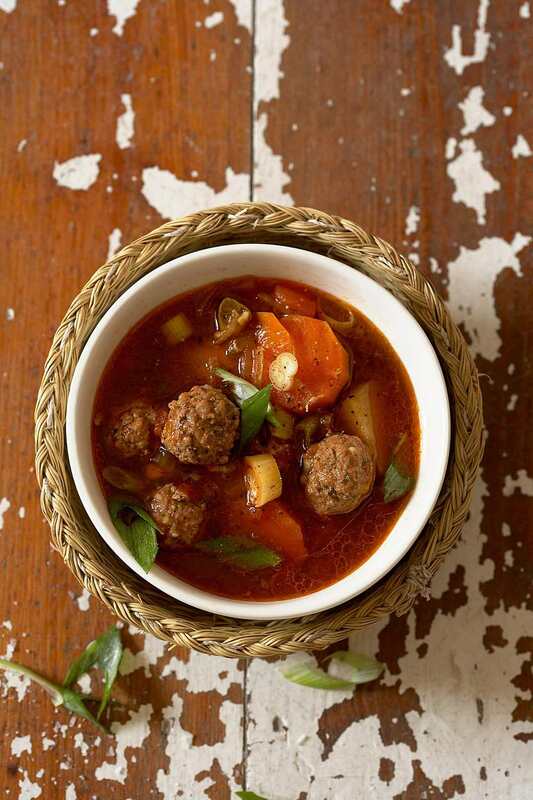 Combine the frozen meatballs, broth, water, and tomatoes in a 3 to 4 quart crockpot. Cover and cook on low for 8 to 10 hours or until the meatballs are tender when pierced with a fork. Nibble on one to make sure it's nice and hot. Stir in the frozen vegetables, thyme, and pepper and mix well. Cover and cook on high for 1 hour or until the vegetables are thawed and hot.